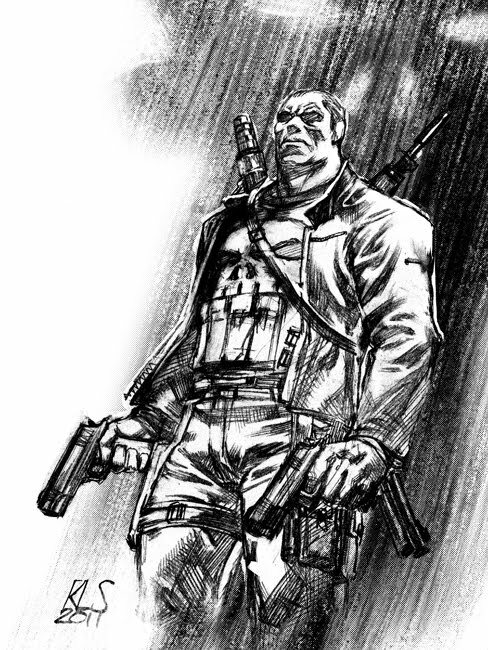 Continuing my sketchy run, here's my Punisher. It should be no secret to anyone that I'm a big Punisher fan having read most of his adventures throughout the past three decades. It's a book I'd love to draw 'cause by this point I feel like I've come to really know the guy. Oh, good God! Ron, this is fantastic! This may be my favorite of the week! WOW! Love the pouches for teeth in the skull! Has that been done before, because it is brilliant! Great drawing! So cool, Ron. Great atmosphere work.